People are skeptical about random phone calls because they suspect you want something from them. They get excited when they aren’t asked for something. When making follow up calls, genuinely express care and concern for your guests. Let them know just how much you enjoy having them. Is there anything we can do for you to make you feel more comfortable at our church? Is there anything we can pray about with you? Watch the full hangout video with Jonathan Malm and Dave Shrein for more church visitor insights. 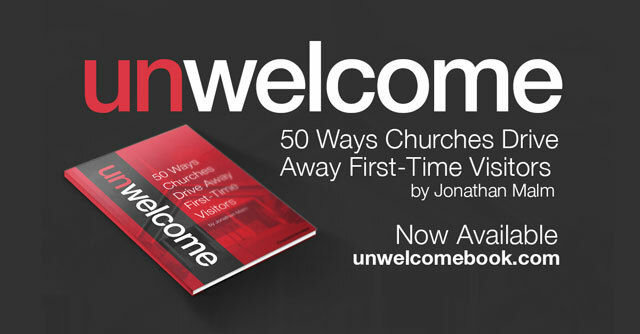 Grab a copy of Unwelcome: 50 Ways Churches Drive Away First-Time Visitors. Learn more about how your church can welcome visitors. Crystal Kirkman is the communications director at First Christian Church in Decatur, Ill. She moonlights as a wife, mom and freelancer (go Illini!). Read more posts by Crystal Kirkman | Want to write for us? Do you recommend a specific method to get contact information from new visitors? Sign in books or comment cards? Do you make them mandatory for people attending service or just hope that new visitors submit their contact info. There isn’t one perfect method for obtaining contact information because every church is unique. Sign-in books might be effective with regular attenders, but not so much with first-time guests. We have tear-off guest cards in our bulletin and ask guests to take them to the Welcome Center to receive a $5 cafe gift card (our church has a full-service cafe). We find that many guests wait after a few visits before they are comfortable enough to give us their info, and that’s OK. Feedback from the true “first-time guests” is what I am looking for. I am doing some work for a very small non-denominational church that is trying to grow membership. They do get walk-ins, but don’t have a good way to engage these guests to find out why they aren’t coming back. Its seems less challenging to get feedback from guests after multiple visits, but its the ones that don’t come back that will likely provide the most valuable feedback. Aligning with some incentive seems like the best approach. I just need to find the right incentive for a tiny church without an in-house cafe! Thanks again for your response! Great post!